Should Your Feet Be Parallel in Mountain Pose and Down Dog? I remember having received a very nice alignment cue when I first began doing yoga asana: The teacher told me to align my feet in down dog so that “your heels hide behind the ankles.” Cool…when I did that, my feet pointed straight ahead, exactly where the teacher said they should point. Later, I heard other teachers’ cues—bring the feet parallel, have the second toe pointing straight ahead, align the outside edges of your feet with the mat. These all felt great for me, and when I became a yoga teacher, this is what I taught as well. Eventually, I came across a student who just wouldn’t listen! I was teaching yoga after work hours at a tech company, and my student was a brilliant engineer. But for some reason, when he came to my yoga class, he became an idiot. I would tell him to align his feet together in mountain pose, and I'd guide the class through a sun salutation—and by the end of the salutation, his feet would be pointing apart in a wide V-shape. So, I would whisper in his ear “Feet together!” This went on for years. He…just…wouldn’t…listen! And then I met Paul Grilley, and I realized what I had been doing to that poor guy. Paul taught me about skeleton variations, how everyone is different, and that there are no universal cues that will work for every body. It is easy for the teacher to see where a student’s feet and hands are pointing, but we don’t have the X-ray vision needed to see what is happening in the pelvis, spine, and shoulders. Structural uniqueness there is what helps to determine where the extremities will be in their neutral, natural, and most effective alignment. So, where should your feet point? I don’t know, but maybe I can help you find out. Figures 1 to 3 (below) show some comparative examples of the variations that may determine where your feet should point. These are photos from Paul Grilley’s explorations. 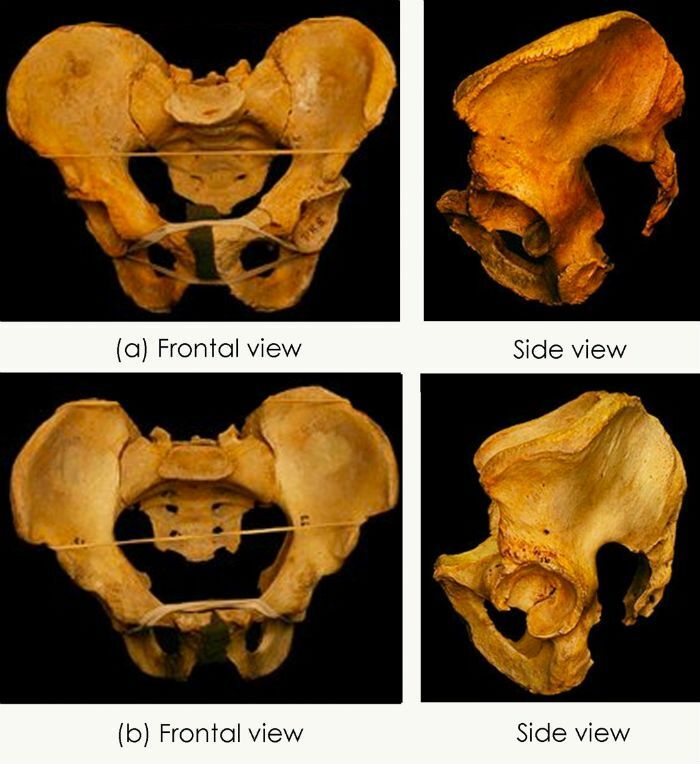 Figure 1 shows two pelvises: Notice where the hip sockets are pointing. Figure 2 shows two femurs (thighbones): Notice the distinct twist (called torsion) in one versus the other. 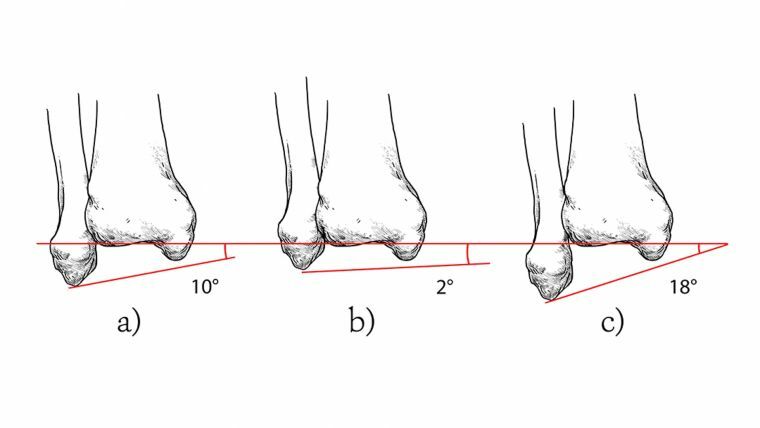 Figure 3 shows similar variations in the tibia (the shinbones). All of these differences affect where your feet will point when you are in your neutral, natural position. FIGURE 1: Notice the placement of the hip sockets on two different pelvises: (a) hip sockets are anteverted—they face forward, allowing greater internal rotation; (b) sockets are retroverted—they face more to the side, allowing greater external rotation. 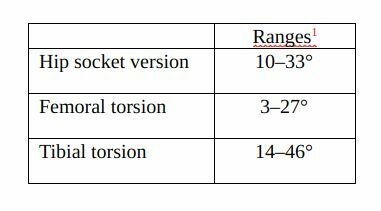 FIGURE 2: Notice the torsion (twisting) of two different femurs: (a) has negative anteversion (also called a retroversion) of –4°, allowing greater external rotation in the hip socket; (b) has an anteversion of 47°, allowing greater internal rotation. 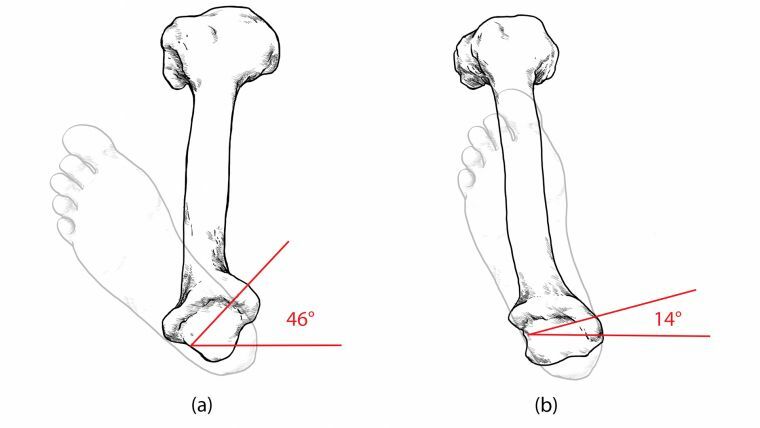 FIGURE 3: Tibial torsion: a right tibia with (a) 46° of torsion, (b) 14° of torsion. 95% of the population is within this range. With little torsion, the foot naturally points more forward; with a lot of torsion the foot naturally points more outwardly. TABLE 1: The normal ranges of variations (“normal” means for 95% of people). You may have a lot of retroversion in your hip sockets (which means your sockets face much more to the side), and very little torsion in your femurs—lucky you! Lotus pose is a piece of cake! But these two measurements are not correlated. The torsion in your femur is unrelated to the orientation of your hip sockets or to the torsion in your tibia. If you have hips sockets that are highly anteverted (which means the sockets face more forward), feet pointing straight ahead feels natural. Or, if you have a high amount of torsion in your femur and/or a low amount of torsion in your tibia, feet pointing straight again feels natural. But if you have high tibial torsion, low femoral torsion, and high retroversion of your hip socket, feet pointing straight ahead is neither normal nor natural for you. In that case, while you can easily do lotus pose, eagle pose may be a struggle. Remember the student I was torturing all those years? If I had only noticed where his knees were pointing! He had a high degree of tibial torsion. As shown in table 1, we all have a lot of tibial torsion: As bipeds, this is a good idea. We can point our feet straight ahead while we walk (another good idea) by internally rotating the leg at the hip socket. But my student has a very large amount of tibial torsion, and he had to use up all his internal rotation range of motion at the hips to align his feet parallel. When his feet were parallel, his knees were rotated internally a lot. I wanted to imagine how he felt, so I came up with a little exercise in empathy that I invite you to try. Stand in mountain pose, using the most common alignment cues: feet together and parallel. Now do a half-sun salutation (ie: a forward fold—bend down and come back up.) Notice how easy that felt. That is how most “normal” people feel. To understand how my student felt, come back to mountain pose: Keep your big toes touching, but move your heels as far apart as they can go. To do this, internally rotate your legs maximally. Notice how this feels as you now do another half sun salutation. Wasn’t that special? Maybe for you, that felt okay—but for most people, internally rotating so much at the hips interferes with the deep flexion needed for a forward fold. That is what I was inflicting on my student. It is no wonder that he preferred his natural alignment: It worked for him. It was functional. I had been giving him cues based solely on aesthetics. I wasn’t seeking what worked for him, but what looked right to me. He wasn’t the idiot: He was smart to listen to his body over his sincere but naive teacher. Today, I will still suggest that students align their feet parallel while standing, but then I ask them to notice how this feels: If it doesn’t feel right, let’s work on finding an alignment that is functional for their bodies. 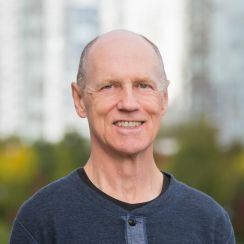 Alignment is important, but we each need to find our own unique alignment, and this applies any time we are on our feet: mountain pose, warriors, and even down dog. FIGURE 4: The tilt of the ankle: The empiric axis runs from the plateau of the tibia (the thicker bone of the two) to the tip of the fibula (the skinny bone). It averages to be an angle of 10° to the horizontal plane, as shown in (a); however, the normal range of variation for 95% of the population is from 2° (b) to 18° (c). If your feet don’t point straight ahead in mountain pose, do they need to in down dog? In this pose, we have another factor to consider: the empiric axis of the ankle joint. This is the line from the bottom plateau of the tibia to the bottom of the fibula, as shown in figure 4. The effect of the empirical axis being oblique can be seen in figure 5. A right foot is shown. When we pull the foot up (dorsiflexion), notice how the big toe of the foot abducts more laterally (outwardly) than when the foot is neutral. When we point the toes down (plantarflexion), the big toe of the foot adducts more medially (inwardly) than when the foot is neutral. The greater the empirical axis angle, the more pronounced this effect will be. 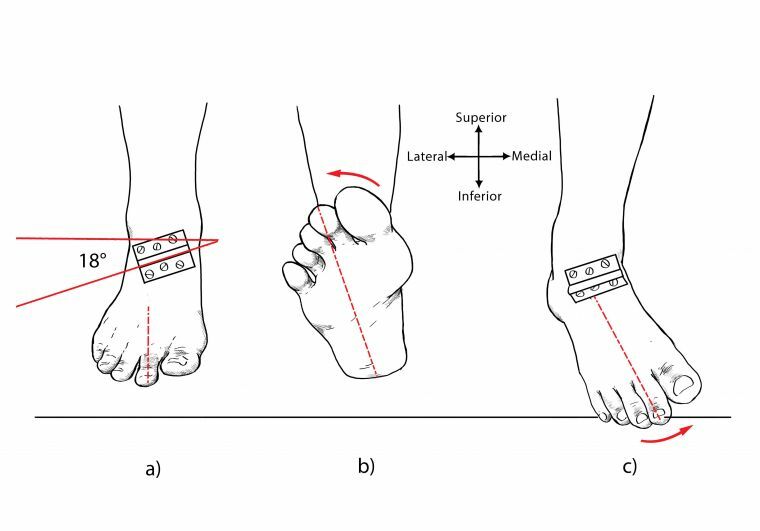 FIGURE 5: The empiric axis affects where feet point: (a) the foot in neutral—notice how the second toe points straight ahead; with dorsiflexion (b), the foot abducts superiorly and laterally (outwardly); with plantarflexion (c), the foot adducts inferiorly and medially (inwardly). The greater the empiric axis angle, the more pronounced this effect will be. This means that the greater your dorsiflexion, the more the foot will appear to point outwardly! When do we dorsiflex? Squats, chair pose, and down dog are some postures where the feet dorsiflex, making it normal for most people to have their feet pointing slightly apart in these postures—but it is not usually taught that way. In plantarflexion, the foot will point in a bit. When do we plantarflex? The back foot does it in pigeon, splits (hanumanasana), and low lunges, when the top of the back foot is pressed to the floor. In up dog, both feet plantarflex. It is natural then for that foot or feet to be slightly turned in: This does not automatically need correcting, but often is. So, in which direction should everyone point their feet? We will never know! If you are a teacher, help the student find her own answer. Give her some options, and let her decide what works best. Go ahead and offer the standard, traditional alignment cues—after all, you have to say something!—but ask her to notice how they feel for her body. Then offer some other options to compare with the standard approach, and direct her to notice how these different positions feel to her. Let’s close with an example—down dog: as shown in figure 6a, start with the standard alignment cues (feet hip-width apart and parallel), and direct the student’s awareness to the feeling of stress in the legs, knees, and ankles, as well as in the pelvis, sacrum, and lower back.2 Then offer the option (b) of having the heels together and feet pointing outward. How does that feel? Some students may find that the heels are now firmly on the floor, whereas they were floating earlier. There may be greater rooting into the earth. Many students love this version of down dog! But, for some, it is not a good idea. Now, try having the feet as wide apart as the mat (c), with the feet pointing inward. How does that feel? Most students will hate that version, but some will love it. Experiment with attention and intention. Eventually, every dog will have his day, and his own pose with the feet right where they should be. FIGURE 6: Down dog (adho mukha svanasana) variations: (a) the aesthetic dog: feet hip-width apart and parallel; (b) the narrow dog, with heels together and feet externally pointed; (c) the wide dog, with feet as wide as the mat but internally pointed. Which is most like your dog? 1. The backup for all numbers cited can be found in Your Body, Your Yoga by Bernie Clark. 2. Note! Stress is not bad, per se. We need stress sometimes. What we are looking for is the quality of the stress. Is it painful? That is bad. Is it a “feel good” kind of stress? If so, stay! Good dog. Bone images taken by Joe Dully are reproduced with the kind permission of Paul Grilley. Illustrations created by Morgan Jeske, reproduced with permission from Your Body, Your Yoga by Bernie Clark.